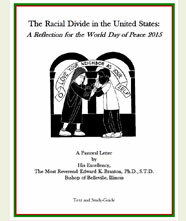 “The Racial Divide in the United States: A Reflection for the World Day of Peace 2015,” is a study-guide is designed to assist parishes, schools, study groups, Small Christian Communities, and others who wish to participate in serious discussions of Bishop Edward K. Braxton’s “The Racial Divide in the United States: A Reflection for the World Day of Peace 2015.” This study-guide should be seen as a flexible resource that can be adapted for use by large or small groups. While the guide is arranged for the participation of members of a group, it can also be used by two people or by an individual. It is for all who, with Christian faith, would like to examine the complex racial divide in our country that is documented in each day’s headlines and the personal experiences of many people. The study-guide will aid you in creating an atmosphere of prayer, openness and mutual respect within which the Bishop’s in depth presentation can contribute to honest sharing and specific actions to bridge the racial divide. Reblogged this on Project Reach Out – Promising Practices. Reblogged this on Mary Ann McSweeny.